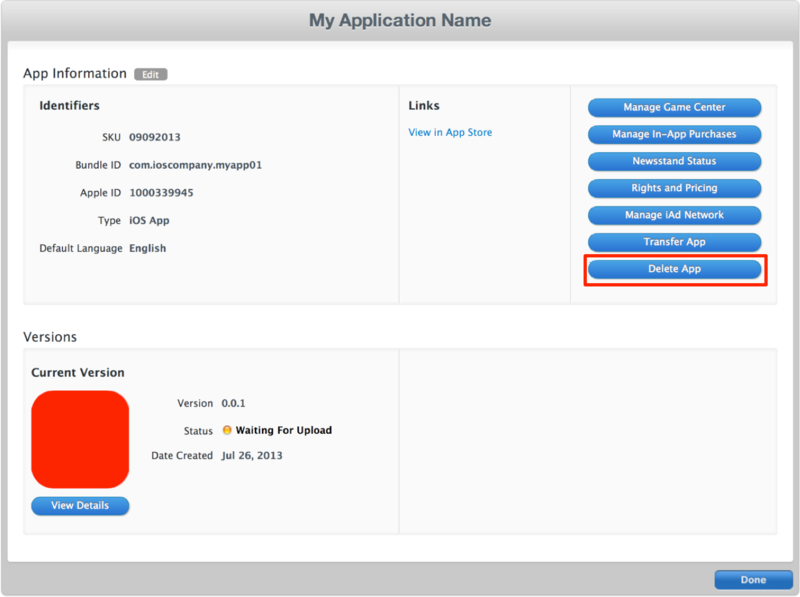 As per apple documentation, We can delete an application which is in a state of waiting for upload. But, how? I searched for the delete button and can't get that. How can a team agent delete it from my itunes connect view? I can't find the delete button in the app details page. You have not yet uploaded a binary for your app, TheGreatApp. Our records show that this app was created in iTunes Connect more than 173 days ago. 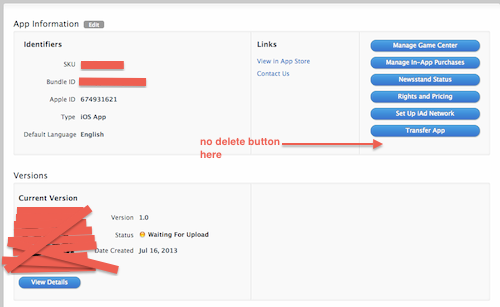 If you do not upload a binary for your app by 13 March 2014 (Pacific Time), it will be deleted from iTunes Connect. The app name will then be available for another developer to use. So, wait for half of year and it will be deleted automatically. Still, I can't see the delete button and I can't delete the application. As the old app's binary version is not uploaded and reviewed, I just renamed that application and then used the name by creating a new one. Apple accepts the name and the app is now in review. Since iTunes connect policy has been changed, If your app is not approved yet, you can't delete the app. Even if you upload your binary and then reject it, it will remains there. The only way delete an app from iTunes Connect it has to be approved once. If you’ve created an app in iTunes Connect that you no longer need to manage, you can delete it from iTunes Connect. You can click on App in Detail page you will get option Delete application. But FYI your bundle identifier & name of application registered will not delete. Not the answer you're looking for? Browse other questions tagged ios itunesconnect application-name or ask your own question. Typical time for Waiting For Review? How to delete app Build in New iTunes Connect Site?